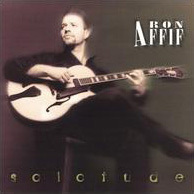 Ron Affif arguably can be described as an ensemble-oriented musician, one who thrives on spontaneity and interplay-both of which can be hard to come by in a solo setting. Nevertheless, he prevails on Solotude by playing what he feels rather than being overly concerned with style and method. Overall, he takes a straightforward approach that focuses on melody supported by well-considered harmonies, while still executing some serious licks (including lightning runs on “Autumn In New York”) and occasionally getting complex, as with “I Love You,” played in the walking bass style of Joe Pass, one of Affif’s mentors.